Located in the High Tech Corridor of Northern Virginia VA, the SpringHill Suites hotel in Centreville, Virginia is located within ten minutes of the Dulles Expo Center and Washington Dulles International Airport (IAD). 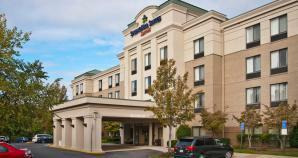 Shopping and dining abound at several shopping centers all within minutes of this Centreville hotel in Virginia. Each of the suites is innovatively laid out, stylishly furnished and smartly designed to give business, government and leisure travelers the flexibility needed to work efficiently and relax comfortably. Each suite is substantially larger than a traditional hotel guest room. Enjoy new healthy and hot breakfast options, complimentary high-speed Internet access, affordable day passes to an adjacent 24 hour fitness center and a quaint meeting room. Add to this the energetic and exceptional service that Marriott is known for, and you understand why business, government and leisure guests keep coming back to the SpringHill Suites Centreville Chantilly.